Be a Part of the Pond Lifestyle! 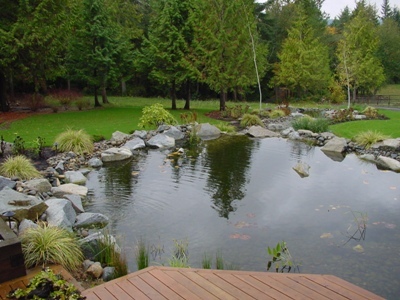 No matter what size or configuration, we can build the pond that will fit your needs and desires. As an Aquascape CAC and Master Retailer, Richard O�Neill has his game figured out. By being supportive and invested in several areas of his local community, he has found many ways to creatively share the water gardening lifestyle with the young and old alike. A recent community project which demonstrates this is at the Children�s Nature Exploration Area at the Snake Lake Park in Tacoma, WA. 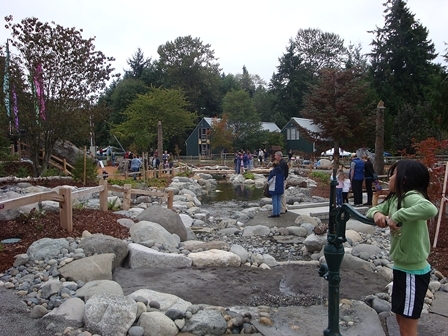 It is a successful, interactive water feature designed for children and families to visit, play, and learn about nature and water. Congratulations from Team Aquascape! ~ Greg Wittstock, CEO, Aquascape, Inc. Completely eliminates need for Algaecides! No matter what the size of your area, a water feature can be added. 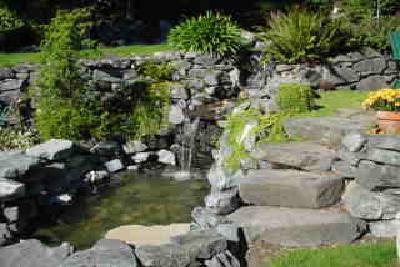 Pondless waterfalls give you the sounds and sights of a pond but are safer if you have young children and are easier to clean and maintain. Add height and interest to your pond with column rocks. 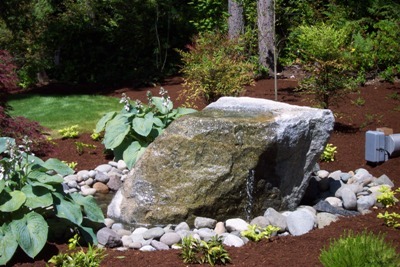 Placing water features in a large area can transform an entire yard! A moderately sized water garden can provide years of enjoyment! 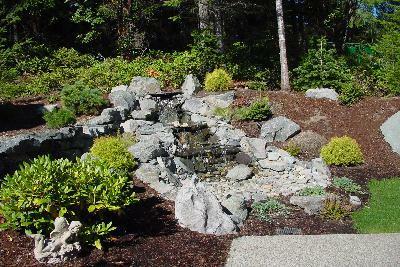 A water feature can enhance even a small area of your yard. RainXChange: Capture, Filter and Reuse Rainwater! Approximately 80% of rainwater runs into storm sewers versus soaking into the ground. The average 2000 sq. ft. home can collect over 60,000 gallons of rainwater a year. Utilizing rainwater for gardens and lawns reduces the strain on municipal systems and the stored water can alleviate water shortages during periods of drought. By capturing rainwater before it enters the sewer system, it can be filtered, stored and accessed for future use on both residential and commercial properties. The Aquascape Rainwater Harvest Storage System is designed to be used with Aquascape water feature products so your water garden can be decorative and functional at the same time. 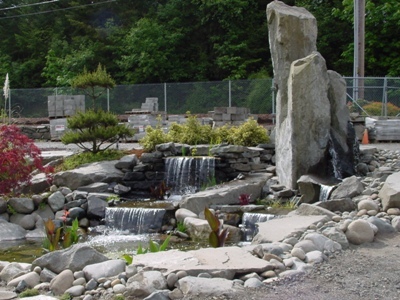 The Aquascape RainBank Systems are only available through Certified Aquascape Contractors like Erin Rockery. With the Aquascape System, there is no more piecing your ponds together. The 20 pond products shown are the heart of the system and are all that you need to build a simply spectacular pond. 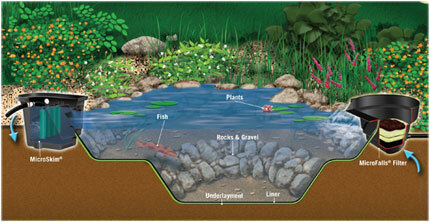 Find everything you need to build your pond right here or on our CAC Pond Store products page. Or visit our retail store at Erin Rockery in Gig Harbor. 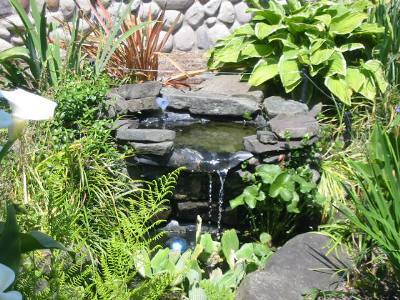 Aquascape wrote the book on building the backyard pond and water garden. 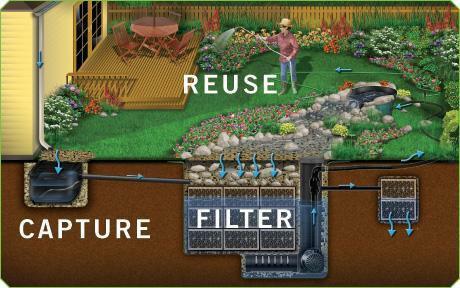 Our years of innovation and close industry collaboration have paved the way for contractors, retailers, and consumers to understand the proper way to build a water garden in 20 simple steps. Kits and supplies are available for any size or type of water garden. We can build it for you or you can do it yourself. Watch for pond building seminars in ''Events''. This is, by far, the most effective way to filter large water features. Our constructed wetland filters - the Snorkel� Vault and Centipede� Module - are modular in design. They allow builders the flexibility to expand the system to meet their project�s needs. Add a professional grade large pond aeration system to increase water quality and complete the system. �	One of the most effective systems for filtering large bodies of water. �	Modular by design, able expand the system to meet project requirements. �	Ideal for retention pond construction and restoration. 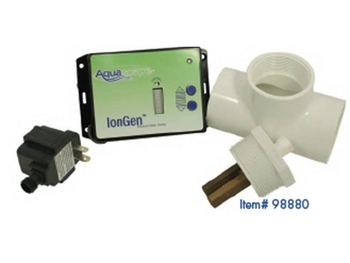 �	Strips out suspended solids and improves water clarity. �	Snorkel clean-out vault allows for easy sediment removal, reducing the need for costly and invasive dredging.